It happends that I watched 3 dramas starring Choi Daniel (Babyfaced Beauty, The Musical, Big Man). The first was a nice rom com, I did not like the drama The Musical at all and he played a good villian in Big Man. I think this one, the forth, will be my favorite. You are so right.... Babyfaced Beauty is my all time favorite..!! I don't like The Musical either.. He was the only good thing in it. . And he was fantabulous in Big Man as the villain. They are all kind-of rom-coms... But this is different, So this would be my favorite Choi Daniel drama of all the time. Can't wait till the premiere. Hope vlive gives us a live broadcast . Today 's Detective' Lee Ji ah expressed her expectation for a new acting transformation. On the 20th, KBS2 , 'Today's Detective', made an interview with Lee Ji-ah, who plays the role of Sun Woo-hye in this work. "I wanted to show a new kind of character that I could not see in the drama so far, and I wanted to show a new look," Lee said. She said, "Sunwoohyeon character always has to give a 'strange' atmosphere, so I'm focusing on that part. It is also important to have a loud voice acting. I have to worry a lot because I have to produce different atmosphere at the moment of 180 degrees. I want you to confirm a new transformation through 'Today's Detective''. " Today's detective 'Choi Daniel was found at the police station. In particular, his eyes are filled with tears that further amplify the curiosity. Choi Daniel captivated the audience by expressing complex feelings such as anger, sadness, regret, desperation. It is anticipated that Choi Daniel's explosive emotional performance will be shown in 'The Ghost Detective '. When I first saw that photo on instagram, I was thinking about the same thing...!! Thank you @larus for posting it on the thread....!! Yes, Daniel's facial expressions are priceless....!! Those eyes can portrait anything & everything about emotions..... Sounds like he's sorted out something terrible about himself or Park Eun Bin's sibling....!!???? Just WOW ....... Those pics are making me even more curious over the plot....!! Hurry up, Sep 05...!!!! We want our handsome detective on our monitor screen . Thank you so much @larus for the post of the 3rd teaser....!! Wow....this is becoming even more interesting now.... . Daniel & Eun Bin are just .... Is the premiere on 29th of Aug...??!!!! Vlive is having a live telecast on 29th of Aug...!!!! Just can't wait . Thank you @larus for the article on new posters.... They are so creative....!! Specially the one Daniel sitting & Eun Bin standing next to him... . He looks so fierce there.... WOW!! This is gonna be a totally scary drama...!! Agree with Asian Wiki...!! . It's only a week for Sep 05 & the day after tomorrow is the premiere..!! ... . Let the count down begins........ Where are the other chingus...?????!! They should come & have a look now!! During the photo shoot, the actor portrayed a tough image that drastically differed from the usually soft and gentle vibe he gave out in his previous productions. His new bearded look also gave a glimpse at his character in his newest drama “Today’s Detective” (working title). And by the way, just one week for the premiere date & tomorrow is the press conference...!!!! . Why don't you post other promotional posters on this thread...??!! I saw a beautiful poster with Daniel staring at Eun Bin somewhere on the net..!! Is some romance available in this seriously scary drama...?????!! Can't wait to know..!! Actress Mi-Ram is confirmed to play a misterious kindergarten teacher in drama The Ghost Detective. The actress has been actively involved in filmography through numerous theater stages and films. She made his debut in the drama 'School 2013' in 2013, appeared in 'Liar Game', 'Blood' and 'Shopping King Louis'. 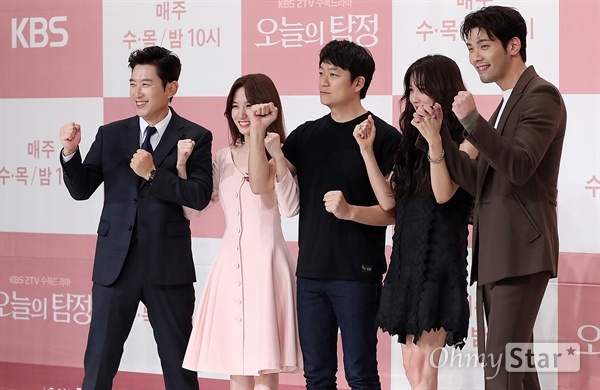 Press conference for drama The Ghost Detective. Kim Won-Hae is hilarious. He re-enacted his character who saw a ghost on the press conferance stage? WOW...!! Finally my most favorite part of the show...... Thank you so much @larus for the pics on the press conference. Daniel is so handsome... Eun Bin is ultra pretty.... Ji Ah is the woman in black & Won Hae sshi is fantabulous. I mean they are so bonded together... And the set would be so entertaining....!! AHhhhh.... I almost forgot...!! 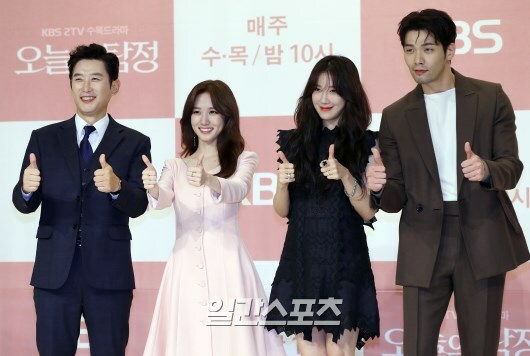 What is the sign in between Eun Bin & the other guy....????!! Shouldn't it be in between Daniel & Eun Bin....????!!!!!!!! I understand your wonder. I want to thank you that by posting here, you made this thrread feel less deserted. 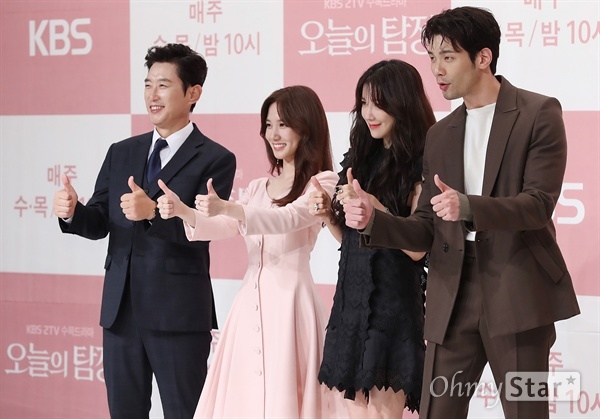 I hope that when the drama will start airing, more people will have a nice conversation about the plot and its characters. He is looking extremely manly here @gm4queen .